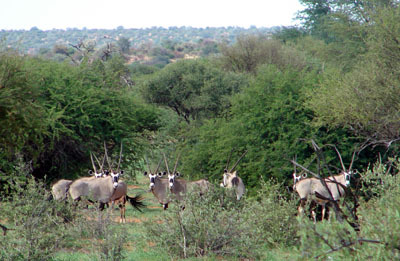 This story of a Kalahari Gemsbok tells you some of the personality traits these African antelopes have. Ask Dries van Wyk, a longtime farmer of the Kalahari, what he can tell you about Gemsbok , and he will say: Don’t ever try to tame it! It happens sometimes that we have to take care of the baby of a wild animal, which had in some way lost his or her mother due to circumstances. Most of the time drought conditions are the cause that the mother does not have sufficient milk supplies. Well, then adoption is the only way out. Just like any other baby in a household, these little animals are at first received with much joy. Everyone admires and adores the new member of the family and promise to help with its care. And as time goes by and the baby grows up, nothing is strange about it anymore and it also requires a lot of time, a lot of milk (for which the cow has to be milked) and a lot of attention. In this story, about Dries and Hilda (his wife), Dries brought home a young little gemsbok that needed care. It was a little bull (regrettably). Well, Dries gave him milk and later on grass and everything he needed in growing up nice and healthy. Dries decided at this stage to castrate his new pet since his common sense (developed through years of encounters with Kalahari animals) told him that this baby boy of him may become a problem when all the male hormones are fully matured). When he was big enough, Dries put him out in one of the camps (breeding areas) so that he could roam around freely. The gemsbok was now almost grown-up. We can say, probably in the 'late teens'. Then one day when Dries was busy in the veld, working with sheep, he received an emergency call (via radio) from Hilda at home. As it turned out, Hilda was busy in the garden to wet some flowers when the tame gemsbok came into the yard. She immediately saw when it came running that it is definitely not a friendly glad-to-see-you get-together. Hilda ran into the house on high alert. Well, if you see such horns coming – you will also run as if the devil was on your heels. Hilda could not even peek from a window. Every time he saw the movement of a curtain, it came and strikes with its horns against the windowsill. He was aggressive! That is when she called on Dries to come and help. When he got home, he took the animal out of the yard to its place and hoped it was the end of the problem. It was not. From then on it was the same story over and over: FEAR when Gemsbok is near! Nothing could scare this pet off. No attempt to chase him away was successful. Gemsbok did not allow anyone near him, but Dries (who was his sole caretaker and feeder when he was a baby antelope). Dries could not even approach him with the vehicle when anybody was with him – be it workers, children or friends. When Dries was alone however, Gemsbok was as friendly, affectionate and easy-to-manage as can come. Then Dries could even stroke his forehead! It became a problem to do any work in the area where Gemsbok was roaming. If the workers or Dries gathered sheep to get some work done, he would always run right to the middle of the flock and chase them around. That caused the sheep to get bewildered and confused and every part of the gathering process had to start all over again. And let me tell you – nobody found it amusing anymore! Dries tried different strategies and one of the most desperate was to shoot with a gun over Gemsbok’s head to try and scare him off. Well, this also was to no avail! And the moral of this story is never to try to tame a wild gemsbok of the Kalahari.